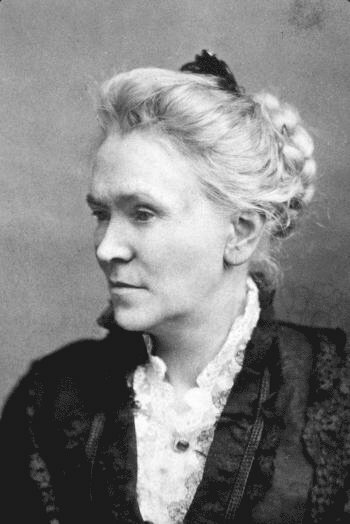 Matilda Joslyn Gage, a women’s rights advocate who helped to lead and publicize the suffrage movement in the United States, was born in Cicero, New York, an eastern suburb of Syracuse, in 1826. Raised in an Abolitionist home that was a station on the Underground Railroad she was well-educated and a prolific writer — the most gifted and educated woman of her age, claimed her devoted son-in-law, L. Frank Baum, author of The Wonderful Wizard of Oz, who had married Gage’s daughter, Maud. Gage, along with Susan B. Anthony and Elizabeth Cady Stanton, was a founding member of the National Woman Suffrage Association and served in various offices of that organization for twenty years. She co-authored with Stanton and Anthony the first three volumes of A History of Woman Suffrage. In 1879 The National Citizen and Ballot Box published the early sections of this work, including Stanton’s account of the first women’s rights convention in Seneca Falls in 1848, of which she was believed to have been the driving force. The newspaper was used prior to printing in book form in order to provide an opportunity for comment. Gage also worked with Stanton on The Woman’s Bible, and in 1893 she published Woman, Church and State, her most widely known solo publication. In 1880 Gage became the first woman to vote in Fayetteville, New York, her home town, under a newly-passed state law permitting women to vote in school board elections.